Lidgate's war memorial is a stone Maltese cross on a square, tapering plinth. The unveiling of the memorial was reported in the Bury Free Press on 15th January 1921, the ceremony taking place on 9th January 1921. The unveiling was carried out by Lt.Col.A.H.Catchpole, attended by local clergy and dignitaries. Sunday will for many years be remembered in lIdgate as a most memorable occasion, when the unveiling and dedication of the War Memorial Cross took place. The cross is situated in a conspicuous and beautiful spot in the churchyard, overlooking the village. Theservice in church began with hymn 165 sung as a processional. 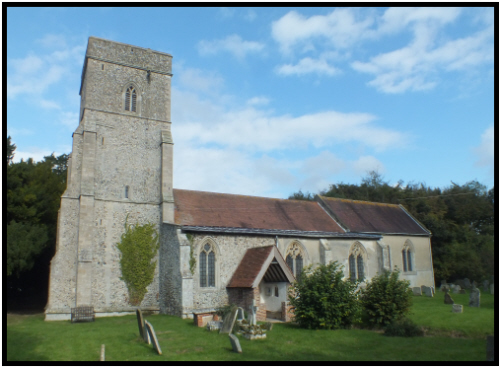 A short service was conducted by the Rev.E.A.Gray, Rector of Lidgate and Rural Dean of Newmarket......the choir came down the church followed by Lt.Col A.H.Catchpole and his Adjutant (Capt. Leach) he 1st Lidgate Scouts and 1st Lidgate Guides and ex Servicemen and formed a long procession to the MemoriaL Cross in the churchyard....the ceremony was proceeded with and Lt-Col. Catchpole addressed the assembly...the Rector read the names of the fallen..."Last Post" was sounded by two buglers belonging to the Newmarket Scouts....Mr A.H. Hanchett of Bury erected the Memorial Cross. Wooden gates with solid panels in the lower half. The top of the gates curves down towards the centre. 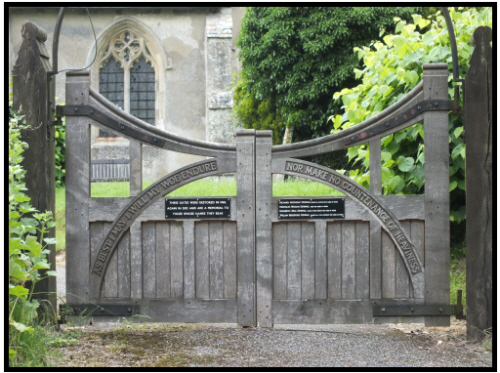 Inscription is carved in raised lettering and runs across the width of the gate on an arched beam of wood. Two additional metal plaques bear inscriptions, mounted on a central beam. 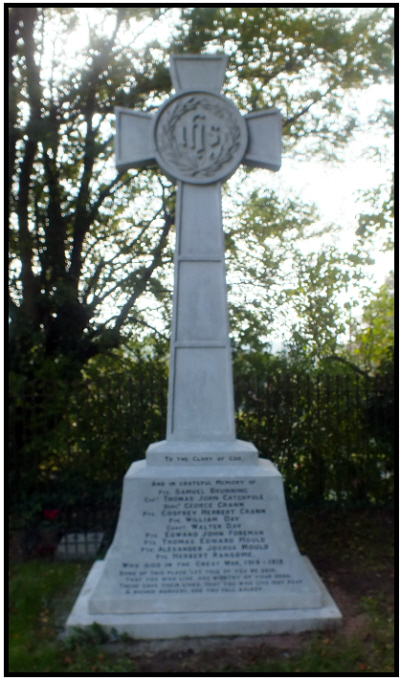 Newmarket Journal 8th March 2001:- "Lost War memorial Found - At Car Boot Sale" A chance purchase at a car boot sale has resulted in a First World War memorial plaque being returned to its rightful owners. The plaque, commemorating the lives of 10 Lidgate men who died in the war, has been returned to the village after it was bought for £1 at a Fordham car boot sale as a dirty piece of metal that could be turned into a bowl. 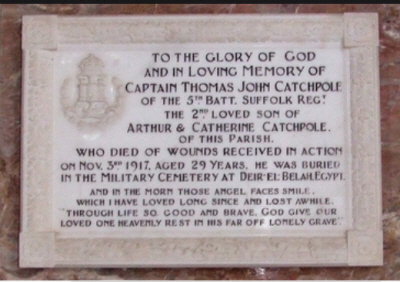 David Alexander, church warden at St Mary's Church, Lidgate, said:"We are pleased it has come back to the village where it rightly belongs and the memory of these men is where it should be." Mr Alexander said the plaque was put up in Lidgate Chapel soon after the First World War.The chapel was turned into a garage about 25 years ago but the plaque remained on the wall. Then it turned up at the car boot sale. "Who removed it from the wall in the garage and how it turned up at the car boot sale we do not known," said Mr Alexander. A man from Thurlow who bought the plaque said the seller told him he found the metal in his father's house in Lidgate when he cleared it out. When the Thurlow man, who does not wish to be named, cleaned up the metal he got in touch with the Royal British Legion who revealed the names matched the dead of Lidgate. The Newmarket Journal of 8th November 2001 carried the story of a special dedication of the war memorial, now installed in St Mary's Church, Lidgate. Geoffrey Woollard, a relative of one of the men read from contemporary Newmarket Journal reports of scenes in the town as the men set out for the Front. Members of the CATCHPOLE, BRUNNING, RANSOME and FOREMAN families whose relatives were killed, were present at the service. 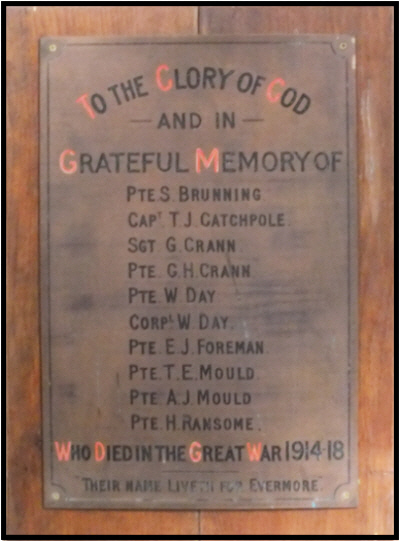 The plaque is inscribed: TO THE GLORY OF GOD AND IN GRATEFUL MEMORY OF PTE.S.BRUNNING, CAPT. T.J.CATCHPOLE, SGT G.CRANN, PTE G.H. CRANN, PTE. W.DAY, CORPL. W.DAY, PTE.E.J.FOREMAN, PTE T.E.MOULD, PTE A.J.MOULD, PTE H.RANSOME. 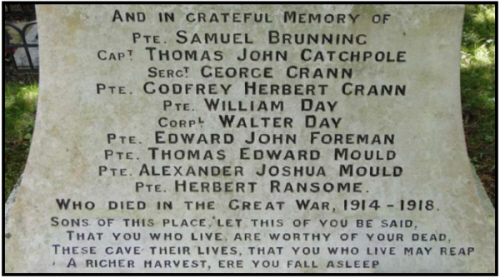 WHO DIED IN THE GREAT WAR 1914-1918 THEIR NAME LIVETH EVERMORE.